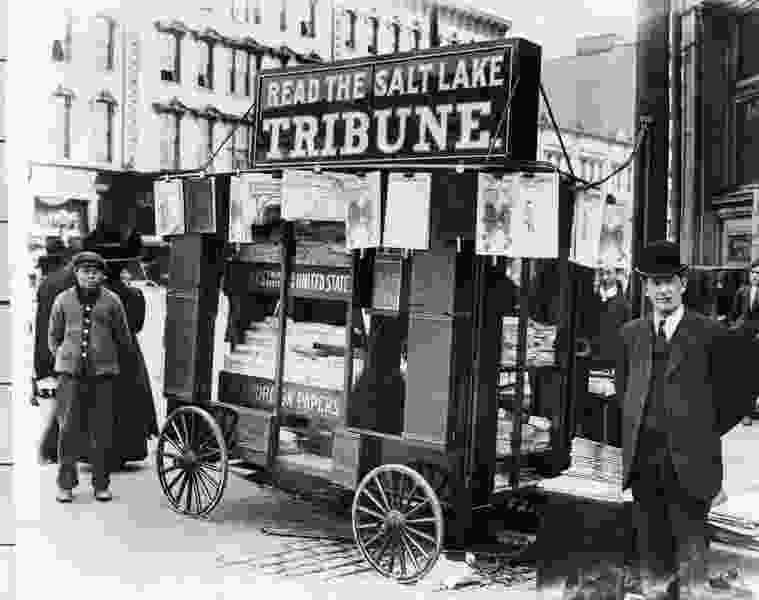 Salt Lake Tribune - Historical File WWII Surrender Page Two persons are standing near The Salt Lake Tribune newspapers stall. The president of the United States is going to great lengths to undermine the credibility of American institutions that are not subject to his personal beck and call. The courts. The FBI. And, of most concern in this corner, the press. This is a serious threat to the future of our democracy, affecting people of all parties and political ideologies. The president attacks the institution of the free press as “the fake, fake disgusting news.” He takes obvious joy in lathering up people who attend his campaign-style rallies to boo, shout at and threaten the reporters covering the event. Clearly, this is all designed to lay the groundwork for his followers to ignore, belittle or distrust news reports covering everything from the separation of children from their parents at the border to the special counsel’s investigation of the presidential campaign’s alleged collusion with the Russian government. It is not at all unusual for presidents to have had their fill of the press. Thomas Jefferson, who once said he would rather live in a country with newspapers and no government over government and no newspapers, was later heard to lament that people who don’t read newspapers are smarter than those who do, because knowing nothing is preferable to knowing things that aren’t true. RIchard Nixon temporarily blocked the publication of the Pentagon Papers by The New York Times and threatened to cancel the licenses of TV stations owned by The Washington Post. “Bad behavior” being, almost certainly, anything the president doesn’t like. This attitude is not in the tradition of the American Constitution. It is a step toward the kinds of dictatorships and totalitarian states the president clearly admires and wishes he could emulate. He wants the press and the people to close their eyes to anything that does not put him and his policies in a good light. He and those who support him in this forget that an independent press is the eyes of the people, alerting them to failures, problems and disagreements that, ultimately, are our responsibility. This editorial is one of more than 200 such pieces running today in newspapers across the nation, in an effort led by our colleagues at The Boston Globe — a publication with a stellar record of going public with things some in power did not want revealed. As such, it runs the risk of being seen as a mass collusion on the part of the media against the president. But this is a fight he chose. And it is essential that the press stand up for its right — its duty — to tell what may be unpleasant or unpopular truths.